2. This promotion is exclusive to all members of Philippine Seven Corporation’s (7-Eleven Philippines) loyalty program, CLiQQ (formerly Every day! Rewards) Rewards card holders and CLiQQ App users. 3. Promotion is open to all residents of the Philippines above 13 years of age except employees and family members of Philippine Seven Corporation, Franchisees, Suppliers, and Agencies including their relatives up to the second degree of consanguinity or affinity. Foreigners must be residing in the Philippines for at least two years. 4. Join the promotion by purchasing a 22oz. 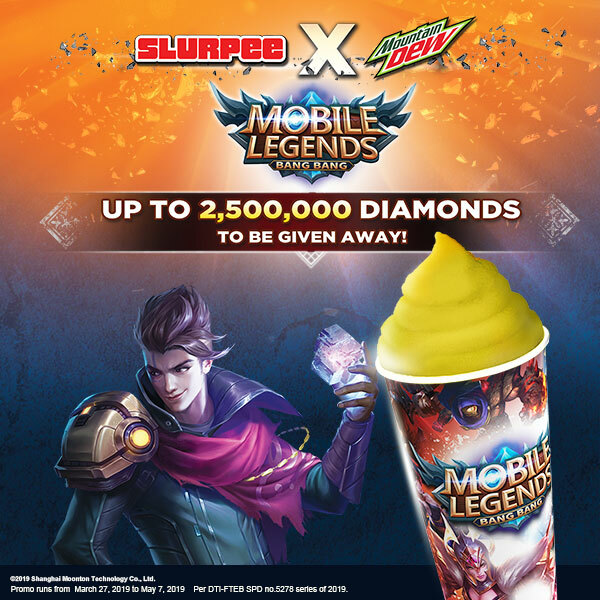 Slurpee of any flavor and earn one (1) Slurpee Mobile Legends e-stamp or a 32oz. Slurpee of any flavor and earn two (2) Slurpee Mobile Legends e-stamps through the CLiQQ app. 6. There is no limit to the number of Slurpee transactions that may be availed to earn corresponding e-stamps. 7. Once the corresponding e-stamps have been earned, customer can redeem the prize by going to CLiQQ Rewards Catalog on the app. 8. A 7-Connect reference number will be sent through SMS upon customer redemption. 9. The customer logs in to https://activity.mobilelegends.com/en/pepsi711/ and inputs their Game ID, 7-connect reference number, and verification code (that will be sent through the in-app mail inbox). Once all info is complete, the customer clicks REDEEM. 10. A confirmation message on the in-app mail inbox will be received if the redemption is successful. 11. Earning of e-stamp is until May 7, 2019 only. Redemption of the e-stamp through the CLiQQ app is until sixty (60) days after end of promo. Redemption of the diamonds using the 7-Connect reference number through the Mobile Legends microsite is until July 27, 2019 only. 12. In case of dispute in respect of Philippine Seven Corporation only and the customer’s participation in the promo, the decision of Philippine Seven Corporation with the concurrence of DTI shall be considered final and irrevocable. However, if the dispute involves the merchant and its performance of services and/or delivery of products to customers, subject to the General Provisions set out above, the decision of, with the concurrence of DTI, shall be considered final. 13. Philippine Seven Corporation does not make any warranty, express or implied, with respect to any of the items and services subject of the Big Bite Dream Big Promo. Except as otherwise provided herein, any dispute concerning the quality or feature of the items or services won shall be settled directly between the winner and the merchant, as may be provided in the merchant’s terms and conditions. 15. Per DTI-FTEB Permit No. 5278. Series of 2019.